On Saturday 8/18/2018 at approximately 1:25pm, the Glen Moore Fire Company was dispatched to the area of Brookview Drive and Mapleflower Road in Wallace Township for a smoke investigation. There were reports of large amounts of black smoke in the woods adjacent to the PA turnpike. Deputy 48 and Assistant 48 went enroute to investigate. They discovered that the smoke was coming from a large uncontrolled trash fire in the area of Deerpath Lane and Mapleflower Road. Engine 48-5 arrived on scene followed by Engine 48-1. The crews extended an 1 3/4 inch hose line and extinguished the fire. ** Notify Chester County Department of Emergency Service of any outdoor burning that will be conducted. ♦ Check for -- and comply with -- bans on outdoor burning. 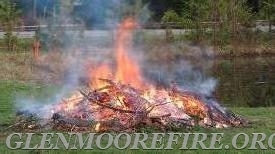 ♦ Avoid burning trash, leaves and brush on dry, windy days. ♦ Stay with all outdoor fires, until they are completely out. ♦ Keep water and hand tools ready in case your fire should attempt to spread. ♦ Burn household trash only in a burn barrel or other trash container equipped with a screen or metal grid to keep burning material contained. ♦ Never attempt to burn aerosol cans; heated cans will explode. ** CALL 911 IMMEDIATELY IF YOU NEED ASSISTANCE OR IF YOUR FIRE SPREADS.